TACLOBAN CITY- About 500 chainsaws were donated to the Philippine Coconut Authority that would be used to clear debris in Yolanda-hit coconut planted areas. These chainsaws, donated by the Swedish power tool producer Husqvarna to the United Nations High Commissioner for Refugees (UNHCR) and later turned over to the other international organizations such as the US-based Catholic Relief Service (CRS) and the International Organization for Migration (IOM) for distribution would be a big help in their effort in clearing the areas where millions of coconut trees felled during the supertyphoon, PCA Edilberto Nierva said. Nierva disclosed in a press conference that with the 13 million coconut trees that felled during the typhoon, and at 528 trees to cut for each chainsaw, the agency will require 24,000 units of chainsaws to totally dispose the voluminous number of coco lumber. 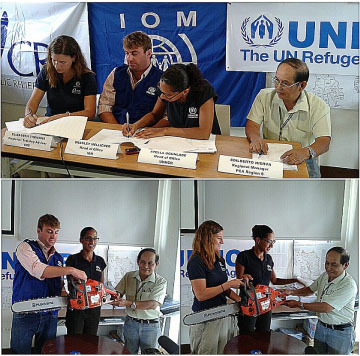 The 500 chainsaws donated by the UNHCR to the farmers through the CRS, IOM and other non-government organizations partners, augments the 171 chainsaws initially deployed by the PCA in badly hit areas in the region, particularly the provinces of Leyte and Eastern Samar. About 1.1 million farmers were adversely affected by Yolanda that walloped the eastern coast of the region with a 5 – 7 meter high storm surges and hurricane-type pouncing wind, the PCA regional manager said. Nierva reported about 40,000 coco lumbers that were sliced equivalent to 40 million board feet and involving 7,000 farmer beneficiaries. He added that of the 50 million coconut trees damaged, about 15 million of them were rendered crownless. What the PCA fears more, however, is the development of the population of the renovator. He said he population of these renovators are expected to develop in six months, thus the agency has to do everything to avert this occurrence with the help of non-government partners in the face of its limited capacity. In the simple turn-over rite and MOA signing held at the Tacloban office of IOM, Nierva admitted that the agency could not do the entire rehabilitation program on its own, citing the cooperation among the performers in this process as key in achieving the ends sought for and accomplishing the purpose of these efforts, that is to rehabilitate the coco industry and help the affected coco farmer rebuild their shelters and re-establish their livelihood. Nierva was a witness in the turn-over ceremony attended by UNHCR head of office Stella Ogunalde, IOM head of office Bradley Mel licker and CRS regional training adviser Elizabeth Tromans.